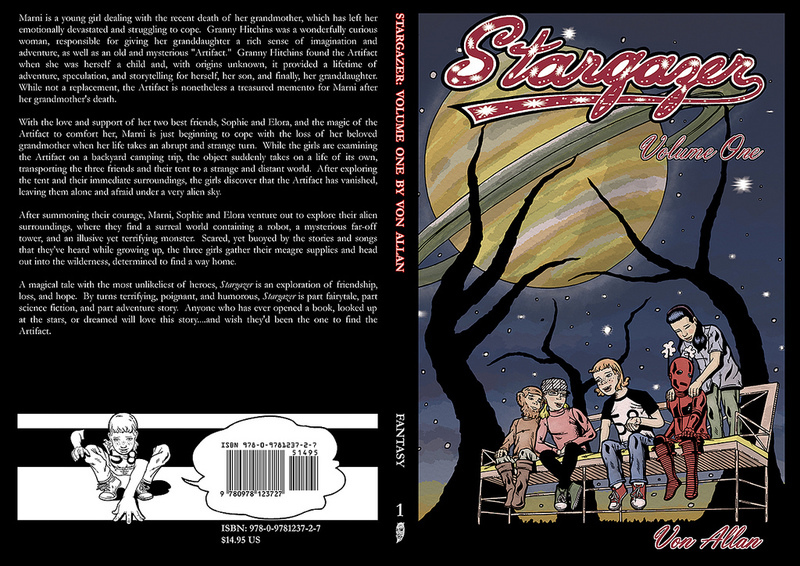 Happenings: Von Allan launches graphic novel Stargazer at Ottawa’s Perfect Books on Nov.7th! Ottawa, Ontario, Canada (October 11, 2010) – All-ages comics and graphic novels are still a rarity in publishing. As comics have skewed to an older and more mature readership, relatively few titles are currently being published which appeal to younger readers. And, of the currently available titles, very few feature girls as the story’s protagonists. Von Allan, an Ottawa-based artist and graphic novelist, is trying to tackle this problem with the publication of his all-ages fantasy graphic novel, “Stargazer.” On Sunday, November 7th, Von Allan will be formally launching “Stargazer” at Perfect Books, an independent neighbourhood bookstore in downtown Ottawa, Ontario. “Stargazer” is the story of Marni, a young girl dealing with the recent death of her grandmother. That death has left Marni emotionally devastated and struggling to cope. Granny Hitchins was a wonderfully curious woman, responsible for giving her granddaughter a rich sense of imagination and adventure, as well as an old and mysterious “Artifact.” While not a replacement, the Artifact is nonetheless a treasured memento for Marni after her grandmother’s death. With the love and support of her two best friends, Sophie and Elora, and the magic of the Artifact to comfort her, Marni is just beginning to cope with the loss of her beloved grandmother when her life takes an abrupt and strange turn. While the girls are examining the Artifact on a backyard camping trip, the object suddenly takes on a life of its own, transporting the three friends and their tent to a strange and distant world. After summoning their courage, Marni, Sophie and Elora venture out to explore their alien surroundings, where they find a surreal world containing a robot, a mysterious far-off tower, and an illusive yet terrifying monster. Scared, yet buoyed by the stories and songs that they’ve heard while growing up, the three girls gather their meagre supplies and head out into the wilderness, determined to find a way home. A magical tale with the most unlikeliest of heroes, “Stargazer” is an exploration of friendship, loss, and hope. By turns terrifying, poignant, and humorous, “Stargazer” is part fairytale, part science fiction, and part adventure story. “Stargazer Volume One” has an ISBN of 978-0-9781237-2-7, a suggested retail price of $14.95 US/$15.95 CDN and is 122 pages in length. “Stargazer” will also be appearing in the November Previews catalogue for January shipping from Diamond Comic Distributors. The book launch will begin at 4:00 PM on Sunday, November 7th and conclude at approximately 7:00 PM. The event is open to everyone.